When Adelaide’s extensive street tram system ceased on 22 November 1958, one line remained – from Victoria Square in the city to the beachside suburb of Glenelg. 28 of the 30 ‘H’ type interurban cars which were built to serve the line when it opened on 14 December 1929 were retained for the service. The trams were externally painted in a silver colour scheme introduced in 1952. The trams were housed in City Depot, around the corner from Victoria Square in Angas Street. Initially, the trams terminated in the south western quadrant of Victoria Square as they had done since 1929. A new terminus was established in the centre of the southern half of Victoria Square in December 1966. During the mid 1960s the fleet was reduced to 26 cars. From 1971 most of the ‘H’ cars were progressively refurbished and returned to the original Tuscan red livery. During the late 1970s work commenced on the complete upgrading of the permanent way which took a number of years to complete (the flyover over the rail lines at Goodwood was rebuilt in 1979). In the 1980s the fleet was reduced to 21 cars by disposing of the remaining silver (un-refurbished cars). Three of these cars (355, 360 and 362) were transferred to the Tramway Museum (355 was later disposed of). A new tram depot was constructed at Glengowrie near the Morphettville Racecourse and opened on 19 October 1986. Pantograph operation in place of the trolley poles commenced on the same day. The City Depot was then closed and the connecting track later removed. 10 of the cars were refurbished with a number of ‘modern’ features from the late 1980s. Car 361, the last of the silver cars was the first car out shopped in this program in 1987. Interestingly, one of the disposed cars (378) returned in 1990 as a restaurant tram. This venture was not successful and after a few years, the tram was stored in the rear yard of Glengowrie Depot. The fleet was reduced to 20 cars (plus the restaurant tram) by the late 1990s. From the year 2000 a further five cars were refurbished. State Premier, the Hon. Mike Rann (left) and Transport Minister, the Hon. Patrick Conlon, at the opening of the tramway extension from Victoria Square to City West. October 2007. One of the weekend heritage services provided by the surviving H type fleet is seen at the former terminus at City West in the City, before running back to Glenelg in March 2009. In May 2003 the South Australian Government announced a $56 million upgrade for the Glenelg tram line, including the purchase of nine new articulated light rail vehicles. The upgrading was completed in readiness for the new trams. The first of the new Bombardier Flexity trams arrived in November 2005. They were numbered 101 – 109. Car 103 was damaged beyond economic repair on the ship during transit to Adelaide and was eventually replaced by a 12th Flexity tram which was given no. 103. In 2005 a bill was passed in Parliament for the extension of the tram line from Victoria Square along King William Street in the city and to the Western end of North Terrace (City West) – a distance of 1.8 kilometres. Two extra Flexity trams were ordered for the extension (110 – 111). In September 2005 tenders were called for the disposal 15 ‘H’ type cars plus the restaurant tram. 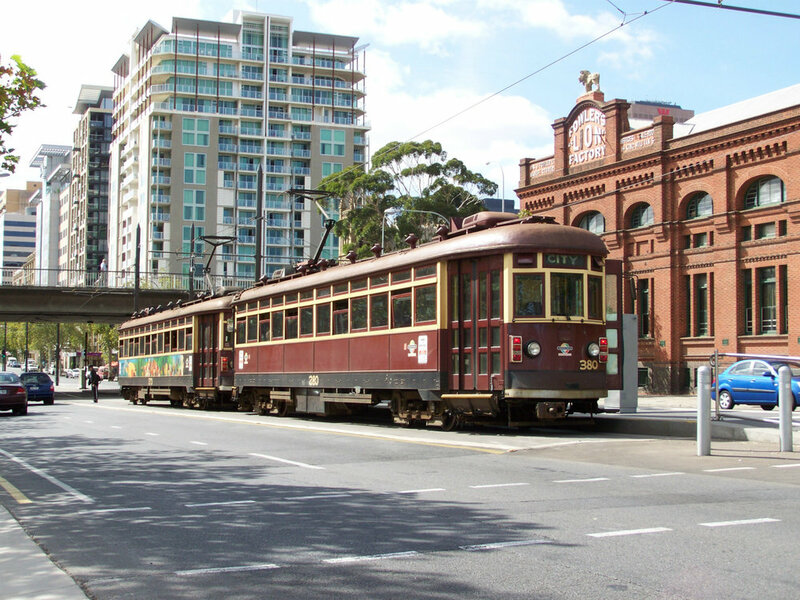 Eight of these cars were awarded to Australian tramway preservation groups in Perth, Melbourne, Bendigo and Sydney, car 364 going to the Tramway Museum at St. Kilda, S.A. to join its other ‘H’ Cars. The restaurant tram was eventually transferred to the History Trust of S.A. and is housed at the Tramway Museum. The five ‘H’ cars refurbished around year 2000 (cars 351, 367, 370, 374 and 380) were retained (although car 374 remained out of service). The tramway extension – the first since 1929 - was officially opened on Sunday 14 October 2007. The service commencing the next day. Car 101 led the procession followed by 351-367 and car 102. Museum members were fortunate to ride on car 351. From City West back to the South Terrace tram stop, a free shuttle service was introduced and a siding constructed at South Terrace. These shuttles alternate with the fare paying trips to Glenelg (although travel on all cars is free from City West to South Terrace). Ten Flexity trams were required for the weekday service (nine in the off-peak). ‘H’ cars provided a weekend heritage service during this time. Alstom citadis 302 tram no. 202 departs rundle mall tram stop towards glenelg. In June 2008 the Government announced an extension of the tram line from City West to Adelaide Entertainment Centre (Hindmarsh). The line extends further West along North Terrace, then right into Port Road, where it travels to Adelaide Entertainment Centre at Hindmarsh (about 2.8km) Construction began in mid 2009. In June 2009 the Government announced that it had secured six new trams. 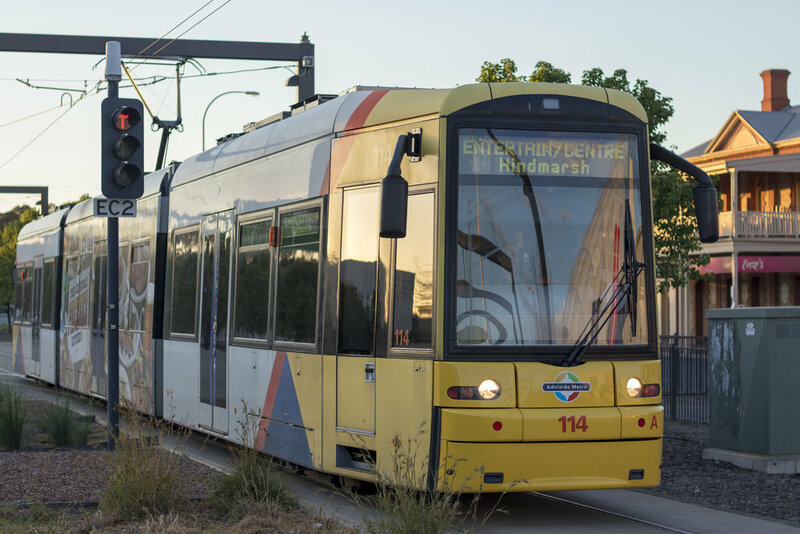 Sourced from the Spanish capital Madrid, through negotiations with local transport authority Mintra, the six Alstom Citadis model 302 trams were shipped to Australia at a cost of around $6million each. The trams were originally purchased to be used on Madrid's light rail network but became available for purchase following a delay in Madrid's planned network extensions. All six Citadis trams had arrived at Glengowrie tram depot by February 2010. They are numbered in the 200 series from 201 to 206 (Flexity trams are numbered in the 100 series, and by coincidence the old H cars are in the 300 series!). The 2.8 km extension of the Glenelg tram line from City West to the Entertainment Centre at Hindmarsh was officially opened on 7 March 2010. Regular passenger service commenced on 22 March 2010. To entice the public to catch trams into the city from Hindmarsh the government introduced free trams to the city upon payment of a $2.00 parking fee at the Entertainment Centre car park at Hindmarsh for an initial period of six months. There were four new tram stops: West Terrace, Thebarton, Bonython Park and Entertainment Centre / Hindmarsh. City Shuttle trams now terminate at a terminal stub between the up and down tracks at West Terrace instead of City West and display ‘West Terrace via City’. bombardier Flexity classic tram 114 arrives at the Entertainment Centre tram stop prior to starting the first ever botanic gardens tram service. Entertainment Centre, Hindmarsh trams terminate in the wide centre road reservation of the Port Road at Hindmarsh where a scissors crossover has been provided. They display‘Entertainment Centre, Hindmarsh’. South Terrace shuttle trams now display ‘South Terrace via City’. In June 2009 construction commenced for a tram flyover to replace the tram crossing at South Road. Trams commenced using the overpass on 8th December 2009. The South Road Tram Stop (Stop 6) was re-opened on Monday 15 March 2010. The tram stop is on the actual overpass. Four more Flexity trams were added to the fleet during 2011-12. Cars 112 and 113 arrived in 2011 and cars 114 and 115 arrived in 2012. Three of the remaining H trams, Nos. 370, 374 and 380 were disposed of during 2011, leaving two remaining H-Types at Glengowrie Depot - cars 351 and 367 (now 352) which have been retained for heritage purposes. H 351 was refurbished during 2012 to represent an 'old' style. H 367 was refurbished during 2014 to represent the silver livery of the 1950s and 1960s and was re-numbered 352. It retains the varnished saloons.